Momodora: Reverie Under the Moonlight on the Playism Store | Bringing a different breed of indie game to the world. Unleash ravaging combos against a variety of formidable monsters and deftly dodge your way through a cursed land to seek audience with the Queen and dispel the evil that threatens all life. For this fourth Momodora game, which is a prequel to the previous games, the primary focus during development was to improve on the gameplay and art. The combat gameplay has truly evolved since the days of Momo III, and the character sprites are now bigger and better animated. We also made an effort to include tiny details here and there, expand on the world lore, and create more exciting boss battles. I believe this is the best Momodora game in the series and definitely the most polished one. Hi, I'm Dan, the Senior Content Manager at Playism. I feel very strongly about how much I love Momodora: RUtM and I wanted to post up a few words about it under full disclosure. I grew up on games starting with the early days of the NES and throughout the years action platforming has been a staple genre among my absolute favorites. Long before Metroidvania was a thing I was infatuated with the original Castlevanias, with Metroid, Contra, Ninja Gaiden and the like. About halfway through the PlayStation's life cycle, sprite-based game development took a nosedive and the games I loved best just weren't being made as often as they used to. Indie game development reinvigorated the genre and the magic of actual sprite animation. rdein's games combine what I always loved about tight action gaming in 2D spaces with splendid influence from modern games like Dark Souls which I am actually playing right now. The way you have to dedicate yourself to the actions you take because of animation locks, the insane intensity driving the boss fights and how epic it is that little ole me can tackle these heroic endeavors, the attention to detail in the environments, designs, animations--all of this stuff is simply stunning and rdein pulls it off to beautiful effect. I wouldn't call Momodora: RUtM a metroidvania or a Souls-like, but there are elements of both in there. It's a game of its own and its one of the best entries in the oceanically broad genre of side-scrolling action. I love it and I'm hella confident that you will too. 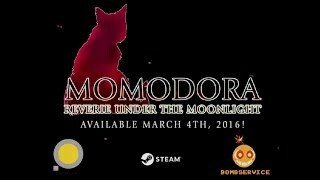 What do you think about Momodora: Reverie Under the Moonlight? We are a development studio focused on developing games inspired by classics from the 80s and 90s. Our flagship series is the Momodora games!